The new textbook «General Conflictology» by Felix I. Sharkov is released. 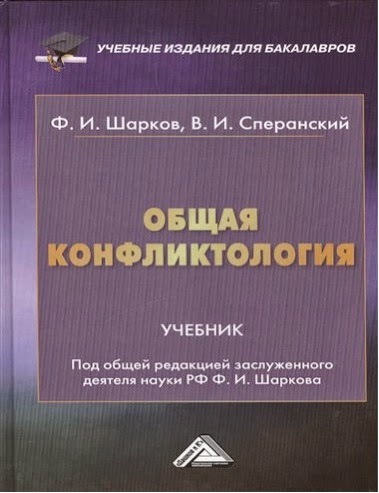 The publishing house "Dashkov and K" has released a new textbook by professors F. I. Sharkov and V.I. Speranskii "General Conflictology: a textbook for undergraduate" (M .: CTI Dashkov and K., 2015. - 240 pp.). The textbook is recommended by the authorized agency of the Ministry of Education and Science of the Russian Federation - GUU - as a textbook for students studying "Conflictology", "Management" and "State and municipal management". In the textbook basic conflictological theories and their relationship with practice are analyzed and modern technologies of conflict prevention and management are presented. Particular attention is paid to labor conflicts, management collisions, interpersonal and intergroup struggles in the social and labor issues. The textbook is written under the general editorship of Honored scientist of Russia Felix I. Sharkov. Felix Izosimovich is a well-known expert in the field of public relations, advertising, branding and other marketing communications, state and municipal government, Doctor of Social Sciences, Professor, Academician of the Academy of Natural Sciences and a number of other well-known academies, the founder of scientific fields "Communicology", "Socionomics", the author of a number of modern communication theories, The head of the department of public relations and media policy of the Institute of Public Administration and Management (IGSU). F.I Sharkov is the author of about 50 monographs, textbooks and manuals.